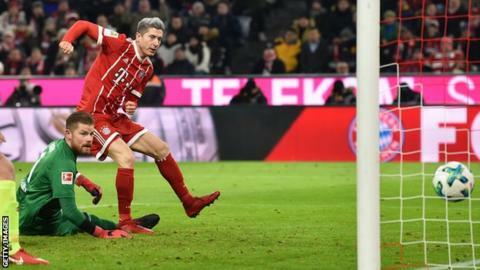 Robert Lewandowski scored his 15th goal in 16 league games as Bayern Munich beat Cologne to move nine points clear at the top of the Bundesliga. Bayern's performance was below par but the Poland international earned his side victory in the 60th minute when he tapped home after being set up by captain Thomas Muller. Lewandowski now has 21 goals in all competitions this season. Cologne, meanwhile, are without a win and are now 13 points from safety. "We didn't do enough and didn't let the ball run," said Muller. "You can't attack against every opponent like we did in the second half - we have to do more." Bayern have won 13 of their 14 games since Jupp Heynckes replaced Carlo Ancelotti as coach at the start of October. Match ends, FC Bayern München 1, 1. FC Köln 0. Second Half ends, FC Bayern München 1, 1. FC Köln 0. Joshua Kimmich (FC Bayern München) wins a free kick on the left wing. Foul by Christian Clemens (1. FC Köln). Attempt blocked. Christian Clemens (1. FC Köln) right footed shot from outside the box is blocked. Assisted by Chris Führich. Salih Özcan (1. FC Köln) wins a free kick in the defensive half. Hand ball by Lukas Klünter (1. FC Köln). Attempt saved. Lukas Klünter (1. FC Köln) left footed shot from outside the box is saved in the bottom right corner. Assisted by Salih Özcan with a headed pass. Attempt missed. Christian Clemens (1. FC Köln) right footed shot from outside the box misses to the right following a set piece situation. Filip Kusic (1. FC Köln) wins a free kick on the left wing. Corner, FC Bayern München. Conceded by Timo Horn. Attempt saved. James Rodríguez (FC Bayern München) left footed shot from outside the box is saved in the bottom left corner. Assisted by Robert Lewandowski. Substitution, 1. FC Köln. Christian Clemens replaces Matthias Lehmann. Foul by Filip Kusic (1. FC Köln). Corner, FC Bayern München. Conceded by Milos Jojic. Attempt missed. Robert Lewandowski (FC Bayern München) right footed shot from the centre of the box is high and wide to the right following a corner. Substitution, 1. FC Köln. Filip Kusic replaces Jannes Horn. Substitution, FC Bayern München. Joshua Kimmich replaces Franck Ribéry. Corner, FC Bayern München. Conceded by Jorge Meré. Foul by Salih Özcan (1. FC Köln). Attempt saved. Niklas Süle (FC Bayern München) right footed shot from outside the box is saved in the top centre of the goal. Assisted by Franck Ribéry. Attempt saved. Sebastian Rudy (FC Bayern München) left footed shot from outside the box is saved in the centre of the goal. Attempt missed. Sebastian Rudy (FC Bayern München) right footed shot from outside the box is close, but misses to the left. Assisted by Franck Ribéry. Substitution, 1. FC Köln. Chris Führich replaces Tim Handwerker. Attempt missed. Robert Lewandowski (FC Bayern München) right footed shot from the right side of the six yard box misses to the left. Kingsley Coman (FC Bayern München) hits the bar with a header from very close range. Assisted by Jérôme Boateng with a cross. Attempt saved. James Rodríguez (FC Bayern München) left footed shot from the centre of the box is saved in the centre of the goal. Assisted by Kingsley Coman with a cross. Foul by Pawel Olkowski (1. FC Köln).